What are the exhibitions that truly changed the course of the discipline, provoked public reactions and contributed to a more complex understanding of what exhibition-making means today? Join curator Jens Hoffmann and artist Carey Young for a critical discussion as they consider questions including the evolving role of a curator, the major changes that have influenced curating and its relationship to art, artists and the wider world. 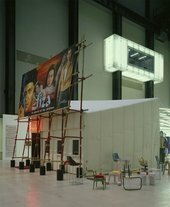 This event coincides with the publication of Jens Hoffmann's book Show Time: The 50 Most Influential Exhibitions of Contemporary Art, in which he examines the innovations in curatorial practice of the last 25 years. The book’s thematic sections focus on a variety of exhibitions, including those that have explored public space; reflected on globalization; engaged audiences in revolutionary ways; and introduced other/new disciplines such as theatre and architecture into the gallery space. Carey Young's artistic practice often focuses on the growing influence of corporations and the legal sphere on to individual and collective subjectivity, which she explores using a variety of media including video, photography, installation and performance. Her interest in the inter-connections between economic systems, contemporary culture and the legacy of institutional critique, offer an invaluable contribution to this debate. Following the discussion, there will be an opportunity to purchase books and have them signed in the Starr Foyer from 20.00–20.20. Jens Hoffmann is a writer and exhibition maker. He currently is Deputy Director of The Jewish Museum in New York, where he oversees exhibitions, collections and public programmes. Carey Young is a London-based artist. Recent solo exhibitions include Migros Museum für Gegenwartskunst, Zurich (2013), Paula Cooper Gallery, New York (2010, 2007); she participated in the Taipei Biennial (2010), Moscow Biennial (2007 and 2013) amongst others. Young has participated in many group exhibitions at venues including CA2M, Madrid (2014), Tate Liverpool (2014), the San Francisco Museum of Modern Art (2012). A monograph on her work, Subject to Contract, was published by JRP|Ringier in 2013, and she will have a solo show at Paula Cooper Gallery, New York, which represents her work, in 2015.